The Library’s Study Break on February 28, 2018 had a special guest in addition to the usual treats and coffee. Gibson, a 2 ½ year old black lab, visited the Medical Library with his handlers, Tami Richmond and Holli Gleason. Gibson joined the State’s Attorney’s staff in 2017 and was recently featured in the State Journal Register for his comforting and calming presence with victims of abuse and violence. Whether laying at a person’s feet during a hearing or next to a child during a difficult interview, Gibson has a gift for under-standing and helping people. 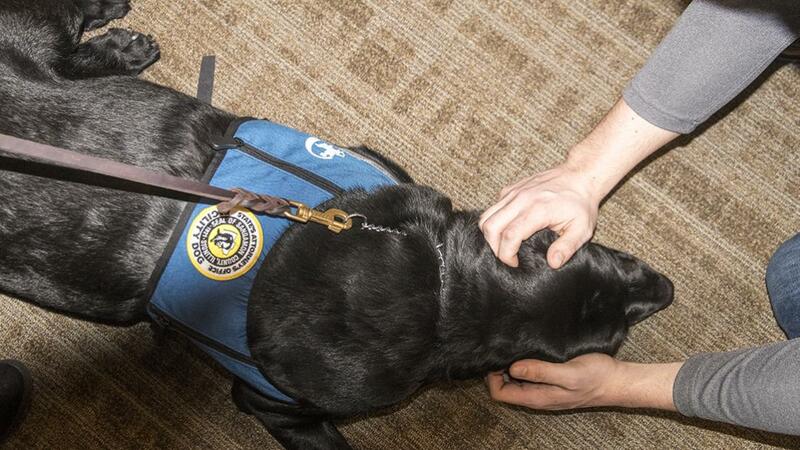 Second year medical students enjoyed Gibson's calming presence as they took a short break from studying and listened to Gibson's handlers describe his training and his job as a courthouse facility dog.